Do You Need a Visa For Hong Kong? Before I get into the specifics of traveling to Hong Kong, and before you start planning and booking travel, you need to take a look at their visa system. First, off, know that Hong Kong visas are VERY different from mainland China visas. In short, you probably don't need a visa to travel to Hong Kong. But there are a couple specifics you should know about which I have detailed in an in-depth article linked below. What Are Temperatures Like In Hong Kong? Hong Kong has a sub-tropical climate, making it pretty hot and humid year-round. But, it is cooled in winter by sea breezes. Summer is especially long and humid lasting from June to September. Temperatures will exceed 90°F during the day and typically don't drop below 75°F at night. Winters in Hong Kong are generally very mild. Temperatures vary between 64–72°F during the day and nights drop to 50°F (sometimes below). Overall, the best (and most expensive time) to visit Hong Kong is between October and December. These months have more comfortable temperatures, although it will still be hot. Rooms get more expensive as the holidays approach. After New Years, the city is very crowded with tourists and room rates are typically the highest. Summer is a popular time to visit but do be aware it will be SUPER hot and humid. Christmas in Hong Kong is considered warm compared with many other Northern Hemisphere countries. Most will arrive by plane and specifically fly into Hong Kong International Airport (Code: HKG). It is also known as Chek Lap Kok. This airport sees flights from every continent in the world and was named Best Airport in the World by Skytrax 8 times. Cathay Pacific flies one of the longest air routes in the world, between Hong Kong and New York (JFK). Hong Kong Airlines has announced it plans to start flights between NYC and Hong Kong in the coming months. Once you arrive there are many ways to get from the Hong Kong airport to the city center. Yes, you can arrive to Hong Kong via Ferry. Hong Kong is only a one-hour (high speed) ferry ride away from Macau. You will arrive by hydrofoil or catamaran. There are also connections to ports in the Pearl River Delta region of mainland China. The main terminals are Hong Kong-Macau Ferry Pier and Hong Kong China Ferry Terminal. TurboJet and Copai Jet are the best services to use. Star Cruises is the most popular cruise line that operates in Hong Kong and can be boarded from the Ocean Terminal in Tsim Sha Tsui. Other major cruise companies also embark at the newly opened Kai Tak Cruise Terminal. You can take a cruise ship to travel to Vietnam, mainland China and Taiwan. There are regular Intercity Passenger Train services from Hung Hom station which is located on the Kowloon side of Hong Kong. From this station, you can take a train to destinations such as: Guangzhou (East), Dongguan, Foshan, and Zhaoqing in Guangdong Province. There are also twice daily trains to/from Beijing and Shanghai which take around 20 hours. Traveling across the border by car is not recommended. Mostly because you have to have two sets of plates: One for China and one for Hong Kong. The best way to get around Hong Kong is using their extensive network of public transport. The first thing you'll want to get when you arrive is an Octopus card. Read my full article on the Hong Kong Subway, getting an octopus card, and more here. 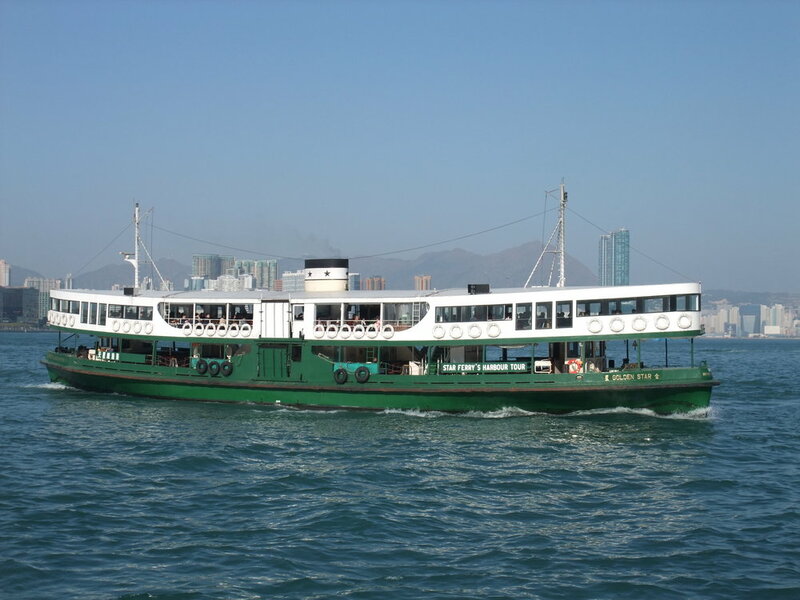 You can travel between Hong Kong island and Kowloon (and more destinations) by Star Ferry. Riding the ferry is an attraction in its self. The most popular line travels from Tsim Sha Tsui to Central and Wanchai from 7:00 AM to 11:00 PM, and offers amazing views. This is especially true when departing from Tsim Sha Tsui. The Star Ferry has carried passengers for over 120 years and the eleven-minute journey across the harbor is definitely a must do in Hong Kong. Traveling on the ferry is very cheap. Prices vary depending on if you are traveling on a weekday (cheaper) or weekend (slightly more expensive). Upper deck seats cost between $2-3. Lower deck cost only $2-2.90. You can pay with your Octopus card, cash, or at the onsite vending machine. Taxis are plentiful, clean, and efficient. They are extremely cheap compared to many other large cities. I use this site to figure out an approximate taxi fare when planning trips. You should know there are three types of taxis in Hong Kong and they are classified by the colors red, green, and blue. When in doubt, just take a red taxi. Red denotes the urban taxis. These can travel anywhere within Hong Kong (except southern Lantau), and are the most expensive. Green taxis are also called New Territories taxis. They are slightly cheaper than the red ones but are confined to rural areas in the New Territories. The last ones, blue Lantau taxis are the cheapest of the three but operate only on Lantau Island. If you are heading to the airport or Hong Kong Disney don't worry about color. All three can be taken. There are lots of things you should know about taxis in Hong Kong and I've linked a longer tip article below. You definitely should know though: Very few taxis accept credit cards, so always be prepared to pay by cash. 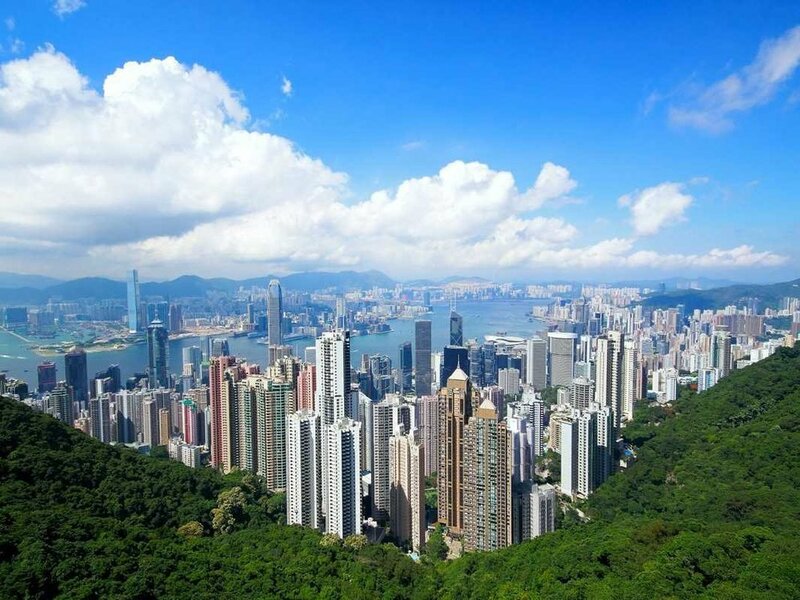 If you are planning a vacation to Hong Kong one of the most important questions you'll ask yourself is where in Hong Kong to book your hotel room. There are many options, at a variety of price ranges, but before I give my suggestions let's take a look at the districts in Hong Kong. Hong Kong Island (purple) is the area that was originally settled by the British. There are many tourist attractions here, as well as the highest skyscrapers and the financial districts. Overall, Hong Kong Island is more modern and cleaner than the other districts. It will also be the most expensive. Kowloon is one of the most densely populated places in the world. Walking around here is a taste of local life. It offers great restaurants, shopping, and tons of tourists attractions. The waterfront (facing Hong Kong Island) holds many luxury hotels that offer amazing views. You can also find budget hotels in Kowloon, specifically in Tsim Sha Tsui. New Territories contain a curious mix of small farms, villages, industrial installations, mountainous country parks and towns. Lantau Island is known for gorgeous mountains and glistening beaches. The island is also full of run-down villages and stray dogs. The airport is located here as well. Outlying Islands are some of the most beautiful parts of Hong Kong. You can island hop on private charters or take a sightseeing tour. Now that I've gone through the districts here's my suggestion: Stay in Kowloon no matter your budget. If you have the money to spend, check out the luxury waterfront hotels that overlook Hong Kong Island. I specifically suggest The Langham - full review of my stay here. If you are on a budget, stay in densely packed Tsim Sha Tsui for an authentic experience. There is no short list of things to do and see in Hong Kong. There really is something for everyone. I have a full list of things to do, broken down by location and type of activity, here. There are way too many different types of food to list, Hong Kong is truly a foodie heaven. But, it I had to narrow it down here a couple of staples you should try out while in Hong Kong. Also, here is a short list of the restaurants, coffee shops, and bars you should try to visit while in Hong Kong. First off, I wouldn't miss Dim Sum. Also, it's possibly the best known Cantonese dish. Dim Sum comes in countless variations but common items include steamed shrimp dumplings, barbecued pork buns, and Hong Kong egg tarts. Siu mei is another must try. The general name covers most roast meats made in a Hong Kong style, including the popular roast pork belly, roasted over an open firepork, roast duck or chicken. Added on top is a slightly crispy honey sauce layer. This makes the final product a unique, deep flavorful dish similar to barbecue. Cantonese congee (juk) is a thin porridge made with rice boiled in water. It sounds strange but give it a try. Sushi is very popular and there are several all-you-can-eat sushi restaurants with reasonable prices. A dessert you definitely shouldn't skip in Hong Kong are Egg Waffles, specifically at the chain Mammy Pancake. So what is this waffle/pancake thing? They are actually in the states as well but we know them as egg waffles, basically it tastes like a Belgium waffle. You can get it in a variety of flavors and dressed up different ways, but I had it with the waffle in a cup, folded to resemble a cone, with ice cream and sprinkles in it. DELICIOUS. There are, of course, many more dishes you should try while in Hong Kong. But, if none of these meals sound appealing - don't worry. Hong Kong is a huge international city with many foreign residents. You'll find plenty of restaurants that serve authentic international cuisine at all price levels.